JAKE ROZAK, MARINE SGT. JOSE MEDIAVILLA, AND LILLAN LIFFLANGER. Economist Jeffrey Sachs connects the dots between the more just and sustainable future that many in the Movement want and feasible economic and political reforms that can get us there. Since the movement began and this film has been released, the national conversation surrounding these issues has expanded and solutions offered in this film are now advocated by large segments of society. Many of these solutions have been implemented into policy proposals and some have been made into law. 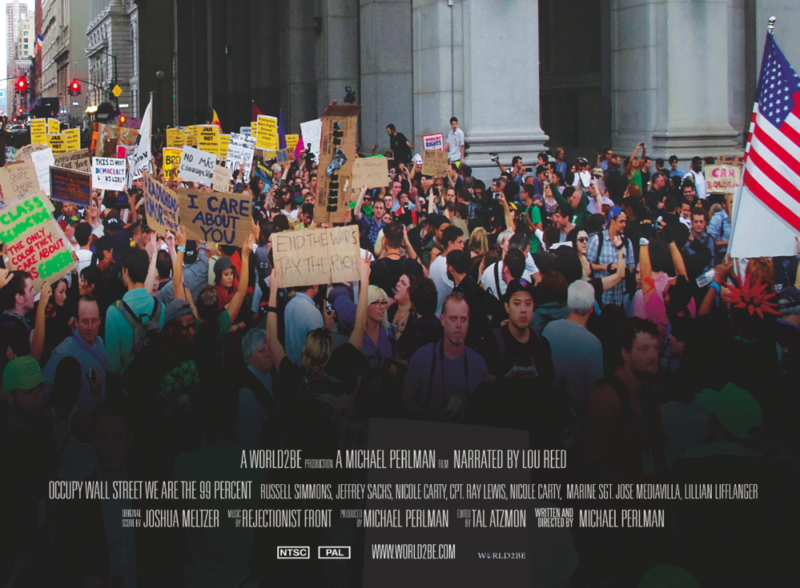 The film highlights the importance of exercising our first amendment rights to gather peacefully and protest in order to remove money from politics and reclaim democracies from entrenched corporate influences as well as the renewed sense of community and empathy that is at the heart of the Movement. The 99%: Occupy Everywhere contains footage that has never been seen before because police physically removed the media during the eviction from Zuccotti Park and other violent crackdowns on peaceful protestors. Special thanks to everyone at Occupy who contributed footage.